Gupta, J. and Nebreda, A. R. (2014). Induction of Colitis and Colitis-associated Colorectal Cancer (CAC). Bio-protocol 4(22): e1290. DOI: 10.21769/BioProtoc.1290. Inflammatory bowel disease (IBD) including Crohn’s disease and ulcerative colitis are characterized by chronic, progressive and relapsing inflammatory disorders. Existing evidence indicate that IBD is associated with a higher risk of developing CAC, which is directly related to the duration and extent of colitis. Thus, animal models have been developed to understand the biology of colitis and CAC. The most commonly used model of colitis is to treat with dextran sodium sulfate (DSS). DSS given in the drinking water is toxic to the colonic epithelial lining and induces bloody diarrhea, ulceration and inflammation, similar to colitis in IBD patients. To study CAC, DSS treatment is combined with a single intraperitoneal injection of the DNA alkylation reagent Azoxymethane (AOM). On day 1, weigh the mice and distribute them into control group (untreated) and experimental group (DSS treatment). We usually mix mice with different genotypes in the same cage so that they are all subject to similar conditions. Prepare the 2% DSS solution (wt/vol) by dissolving DSS salt in autoclaved drinking water. Prepare enough DSS for 5 days. We do not change DSS during the treatment. Fill the drinking bottles of the cages with DSS solution. Weigh the mice every other day. Body weight loss indicates that the DSS treatment is working. Mice that lose more than 20% body weight at any time point should be sacrificed following guidelines for animal care. If the majority of mice are losing more than 20% body weight, DSS concentration should be reduced to ease mortality. On day 6, replace the DSS containing bottles by autoclaved water. In our experience, 5-days treatment with DSS suffices to induce acute colitis in C57BL/6 background mice, but the outcome is highly dependent not only on the mouse line but also on the housing facility and the batch of DSS, so it must be tested in each case. To study acute colitis, mice can be killed by cervical dislocation at day 7, one day after termination of the DSS treatment. In our experimental conditions, we see maximum colitis score in histological analysis at day 7. Afterwards, mice start to recover from the DSS induced damage. If the aim of the study is to determine recovery from DSS-induced damage, further time points should be analyzed, for example at days 10 and 13. In this case, mice should be weighted until the endpoint. On day 1, weigh the mice and distribute them into control group (untreated) and experimental group (AOM/DSS treatment). Prepare AOM at the concentration of 1 mg/ml in sterile PBS. AOM is a cancer-causing reagent, thus appropriate precaution and protective measures should be taken to handle it. Inject mice intraperitoneally with AOM solution using 1 ml syringe. Final concentration is 10 mg/kg body weight of mice, i.e. 100 μl AOM solution of 1 mg/ml concentration per 10 g mouse body weight. Weigh the mice every other day as in step A4. On day 6, prepare the 2% DSS solution (wt/vol) and treat mice for 5 days as in step A. Continue weighing the mice until they recover the body weight of day 1 of DSS treatment. On day 11, replace DSS containing bottles with autoclaved drinking water and leave for 14 days. On days 26-31 and days 46-51, repeat DSS treatment as above. On day 100, evaluate tumor development. Sacrifice mice by cervical dislocation at the endpoint of the experiment, for example at day 7 for colitis analysis and at day 100 for tumor analysis. Open the mice using sterile forceps and scissors to carefully remove the entire colon and place it in a 10 cm Petri dish with 15 ml cold sterile PBS, which should be enough to cover the entire colon. Carefully hold the distal part of the colon with the help of forceps and then flush to remove feces with 5-10 ml cold sterile PBS using a 21 G needle attached to a 5 ml syringe. After flushing the feces, put the cleaned colon in a new Petri dish. Carefully open the colon longitudinally and rinse again with cold PBS to remove remaining feces. For the colitis experiment, fix the longitudinally open colon as “swiss-rolls” in 10% formalin solution at room temperature overnight and then embed in paraffin using standard protocols. Briefly, colon tissue is processed in an automatic tissue processor for dehydration with ascending series of ethanol (70% ethanol, 2 incubations in 96% ethanol, 3 incubations in absolute ethanol, 1 h each), then cleaned with xylene (3 incubations of 1 h each), followed by 3 incubations in paraffin wax at 61 ºC and finally embedded in a paraffin block. To evaluate colitis, paraffin sections should be stained with H&E and analyzed by an experienced pathologist in blinded fashion to score for epithelial damage and inflammation. An additional parameter for the severity of colitis is the percentage of body weight loss during DSS treatment, which is calculated by comparing the body weight at different times with that of day 1 and can be represented in a graph. In our hands, using 2% DSS and mostly C57BL/6 background, WT mice lose 5-8% of body weight while mice lacking p38α in intestinal epithelial cells may lose up to 15% body weight, which correlates with a higher colitis score (inflammation and epithelial damage) evaluated in H&E-stained colon sections. For the AOM/DSS experiment, count the macroscopic tumors in the longitudinally open colon. In our in-house bred mice with mostly C57BL/6 background, tumor development is observed in 100% of the WT animals (Gupta et al., 2014). Tumor size (average diameter) is measured using a digital caliper and tumor load per mouse is calculated by summing up the sizes of all the tumors in a given mouse. 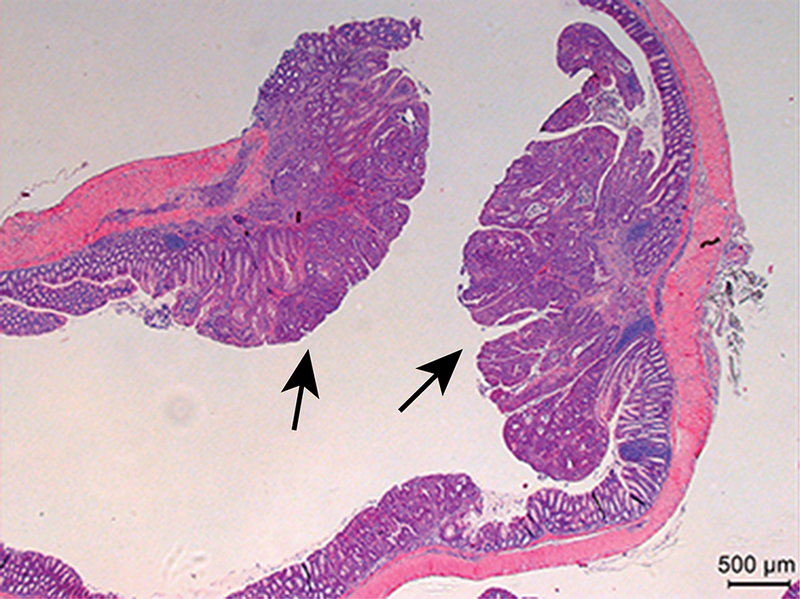 After counting tumor numbers and load, longitudinally opened colons can be photographed (Figure 1) before fixing them as ”swiss-rolls” in 10% formalin solution and then embedding in paraffin. H&E stained paraffin sections (Figure 2) should be analyzed for tumor grading and immune cells infiltration by an experience pathologist. Figure 1. Example of a longitudinally open colon at day 100 of AOM/DSS-treatment showing colon tumors (arrows). Tumors are counted macroscopically and tumor sizes are determined using a digital caliper. This protocol is highly dependent on the mouse genetic background, the animal housing conditions and the AOM and DSS batches. The working concentration of DSS should be determined empirically in pilot experiments. We have used the AOM/DSS protocol to induce colon tumors in mostly C57BL/6 background and mostly FVB background as well as in mixed C57BL/6-129v mice. In all cases, tumors were observed in 100% of the mice analyzed at day 100 of AOM/DSS treatment. If no tumors are detected at this time point, AOM concentration and/or DSS concentration should be increased. For the colitis experiment, between 2% and 5% DSS for 5 days should be enough to induce epithelial damage. Alternatively, the DSS treatment can be extended if little or no damage is observed at day 7. Our work is supported by the Fundación BBVA and by grants from the Spanish MICINN (BFU2010-17850) and the European Commission FP7 (INFLA-CARE 223151 and ERC 294665). This protocol is a modification of the protocol published by Neufert et al. (2007). Neufert, C., Becker, C. and Neurath, M. F. (2007). An inducible mouse model of colon carcinogenesis for the analysis of sporadic and inflammation-driven tumor progression. Nat Protoc 2(8): 1998-2004. How to cite: Gupta, J. and Nebreda, A. R. (2014). Induction of Colitis and Colitis-associated Colorectal Cancer (CAC). Bio-protocol 4(22): e1290. DOI: 10.21769/BioProtoc.1290.